Phoney World has reported that NewDehli is the most recent addition to the Visual Radio roster of served locales. 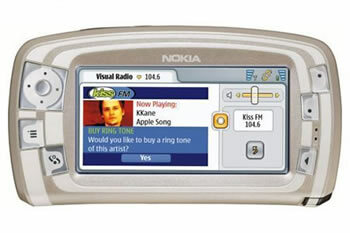 Visual Radio is the technology developed by Nokia that allows other information [visuals, interactive components, buy-this-song capabilities, etc.] to be added to regular terrestrial FM radio broadcasts. The devices, like the portable model pictured above allow the listener to receive the regular radio transmission as they would with a normal FM receiver, or switch to interactive mode. The official Visual Radio site lists participants in six countries including Infinity Broadcasting in the US. ← It’s all over, kids.